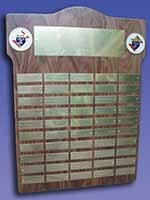 K of C Perpetual Plaque 18"x24" "Genuine Walnut" (50 gold plates). Available in Emblem of the Order or 4th degree. Engraving costs 0.35 for each character up to a maximum of 50 characters.